With such an appreciative audience (alright it's actually just hubby and Little L), I can't help but up the ante a little when it comes to dinner. After all, cooking is a form of relaxation for me. That's not to be confused with washing up which is a task worse than ironing. Little L's enthusiasm for cooking has inspired me to try out different cuisine everyday. Last night I decided to concoct my version of Beijing roast duck complete with pancake. When we had Little L's godparents over last weekend, I made wild mushroom and porcini pasta to rave reviews. I had a similar dish at a wonderful restaurant which I will not mention because on a subsequent visit with Little L, I discovered that kids are NOT allowed to step foot into their restaurant for a meal. I heard through the grapevine that the owner isn't keen on kids. Hence, the place is virtually empty each time I'd been in there with a friend. Anyway, the dish cost £10 for one but I actually made it for £10 and it served 4 adults and a child. A few nights before, I thought it'd be a good idea to revisit the country of my birth and cook beef rendang. 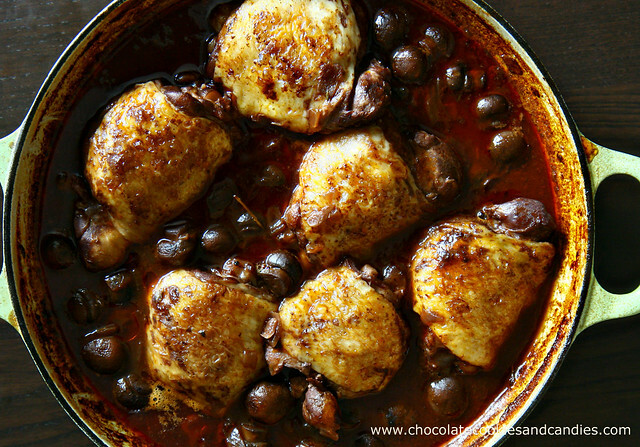 The next day I had craving for French so chicken chasseur was the special of the day. Today, it's warm and sunny again so what better way to celebrate good weather than an Italian meal consisting of sweet and juicy peaches wrapped in prosciutto with fresh mozzarella on the side. I thought I'd share this pasta recipe "Bucatini alla Possillipo" or otherwise known as Bucatini with sausage and pancetta from a cookbook "Truly madly pasta" by Urusla Ferrigno. This dish is named after a restaurant in Palermo, Sicily. I've made this numerous times over the past 5 years for friends and family with great success. I've had a lot of requests for this recipe so here it is, after 2 years of waiting. I guess it's better late than never. Sorry about the tilted photo. Just a reminder, do NOT take photos of food if you're hungry. 1. 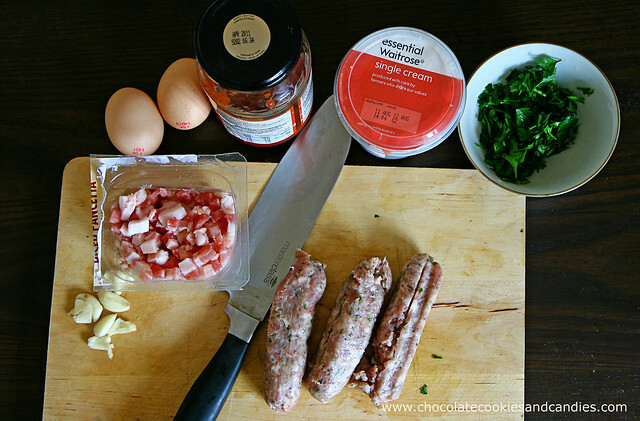 Remove any skin from sausage meat and break the meat up roughly with a knife. Puree the tomatoes in a food processor or blender. If you use passata, you can skip this step. 2. Heat the oil in a medium saucepan, add the garlic and fry over a low heat for 1-2 mins. Remove the garlic with a slotted spoon and discard it. 3. Add the sausagemeat and pancetta or bacon and cook over a medium heat for 3-4 mins. Stir constantly with a wooden spoon to break up the sausagemeat. It will become brown and look crumbly. 4. Add the pureed tomatoes to the pan with half the parsley and salt and pepper to taste. Stir well and bring to boil, scraping up any sendiment that has stuck to the bottom of the pan. Lower the heat, cover and simmer for 20 mins, stirring from time to time. Taste and adjust the seasoning if necessary. 5. Meanwhile, cook the pasta to boiling salted water until al dente (tender) but still firm to the bite. 6. Put the cream and egg yolks in a warmed large bowl and mix with a fork, seasonoing with salt and pepper. As soon as the pasta is cooked, drain it well and add it to the bowl of cream mixture. 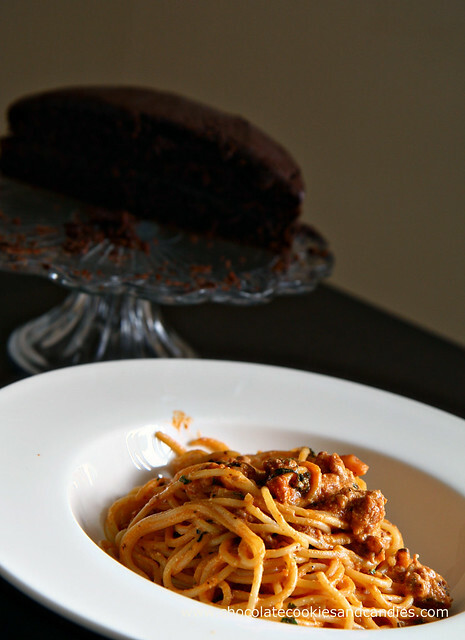 Toss until the pasta is coatd, then pour the sausagemeat sauce over the pasta and toss again. 7. Serve immediately in warmed bowls, sprinkled with the remaining parsley. Mouthwatering! My son loves pancetta (and all forms of bacon) so I need to try this!! Wow, thanks for sharing this recipe. I am always looking for ways to cook up pasta (my way is just opening up the pasta sauce jar and pouring it over the pasta- haha). This looks like it would definitely pass as a restaurant quality meal, without the $$$. Yum Yum, thanks for the post! Yummy. Thanks for the recipe. I'm gonna try it some day. Recipe doesn't look that complicated (and scary). I'm always on the lookout for easy recipes (As you may have figured, either I'm a lazybone or I'm just not too bright). "cooking is a form of relaxation for me" - couldn't help but smile because that's what I always say: I can be angry, annoyed, anxious...as soon as I start chopping I relax. On another note - could you please also share the recipe for wild mushroom and porcini pasta? Sound delicious too! Sharon, LOL, it's actually really easy to make your own pasta sauce. Far more tasty too. Kat, hope it's all sorted out. chicology, I stay far far away from complicated recipes. As much as I like cooking, I prefer simple yet tasty dishes that don't require a million different ingredients. Sog19b, I certainly will share the recipe for wild mushroom and porcini pasta. Will do so later this week. yum! anything with pancetta in it HAS to be good.